I am emailing to ask you to help save 189 vital jobs in the North East of England at National Grid’s Newcastle office. National Grid are threatening to close their Newcastle operation and offshore the work to low wage economies such as India. This comes despite National Grid making a massive profit of nearly £3billion, a 12% rise from the previous year, and being able to find thousands of pounds to pay for a Senior Executive to park his Ferrari in a dehumidified garage. GMB is fighting to stop these job cuts and have launched a campaign to keep the Newcastle operation open. Please visit www.nationalgreed.co.uk and sign the No.10 petition, contribute your views to the blog and support the campaign to save jobs in this time of major recession. Britain’s trade union movement loses an extraordinary man. Fancy Becoming a Radio Producer? Point Blank, a wonderful music education college that specialises in working with disenfranchised young people, are running a free one week accredited Radio Production course between 23rd – 27th March and still have a number of spaces available. The course will be run in either Hackney or Leytonstone. Funding is available to assist with travel expenses. Author MirandaPosted on 12/03/2009 12/03/2009 Categories Business and Employment, Community, MediaLeave a comment on Fancy Becoming a Radio Producer? We want get people signed up early for the April TUC courses which run at the Herts Trade Union Learning Centre in Watford. The centre is right next to Watford Junction railway station. Please see the enclosed forms, HERE and HERE , which give you details. Union Reps Stage 1, Stepping Up (formerly Union Reps Stage2), Health and Safety Stage 1, and Next Steps for Safety Reps (formerly Health and Safety Stage 2) are available to all union representatives and last for ten days, one day a week. 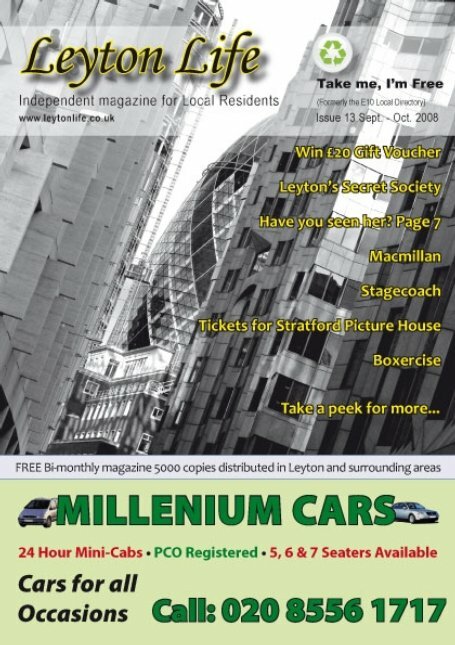 About a year and a half ago, I wrote a feature about a brilliant local directory entitled ‘E10’, which helped promote business and community life in the Leyton area. You can re-read that post HERE. This post is just a quick note to let people know that E10 now has a new Editor, Yasmin Allen, and a new name, ‘Leyton Life’. However, despite all the changes, Yasmin’s as keen as ever to receive your adverts, news, views and feedback. All best wishes for the future to former editor Clare McCaughren and her family and best of luck Yasmin!